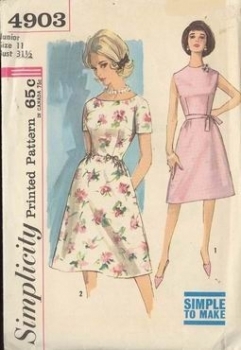 Simplicity 4903 Size Junior 11-Bust 31.5 inches, waist 24.5 inches, hips 33.5 inches Cut and complete $12 This “simple to make” dress is fitted with darts and there is a back zipper closing. The slightly flared skirt has gathers at each side of center front at waistline and is dart fitted in the back. Version one is sleeveless with a high rounded neckline and a self-fabric tie belt. Version two has a lowered neckline and short, set-in sleeves. Two self-fabric bows trim the front waistline at each side. Suggested fabrics include cottons and blends, velveteen, corduroy, brocade, silk, and many others.